Pope Francis’ two-day visit to Ireland on the 25th and 26th of August 2018 comes at a time when people need hope. The Irish Church has been devastated by the abuse scandals, which have never been properly dealt with. The victims and survivors of church abuse have told their stories and knocked on doors trying to get a hearing, and meet those who would listen to the terrible injustices perpetrated on them by some Catholic clergy and religious institutions. It is only in the last few years that it has been recognized by the Catholic hierarchy that clerical abuse has taken place. The pain, frustration and anger of so many victims have been allowed to fester and perpetrators of these abuses in the past often protected for fear of damage to the institution. As with all corruption, unless we go to the root of the problem and take positive action to root it out completely, we can never have a true healing. It was into such a situation of pain and suffering of victims of clerical sexual abuse that Pope Francis arrived in Ireland. The Pope’s plea for forgiveness for the abuse scandals was long overdue. The Pope’s call for forgiveness and firm and decisive action will be followed closely by many. I would support the victims call for a tribunal to be set up by the Pope to judge the bishops action and make and hold the perpetrators of the abuse to full account, so demonstrating and a commitment to full transparency and accountability. So too on the question of reform in the church. Renewal and Reform of the Catholic Church is necessary and can no longer be delayed. The renewal of the church will not be easy, but it can begin immediately with a holding of the Vatican Council III in which, through respectful listening and deep dialogue, solutions to the urgent issues of today can be found and put into place. The abuse scandal in Ireland is only the tip of the iceberg, as indeed in many countries human dignity is being destroyed with the abuse of children, women and men, as they are deprived of the basic needs to enable them to live fully human and dignified lives (and know what it is to be poor and live in an unjust world where the rich are getting richer while the poor are getting poorer). The basic right of freedom of conscience for people – to be allowed to choose how to live their lives – must be upheld. It was very symbolic that Pope Francis spoke from the Marion Shrine at Knock where the message of peace and nonviolence needs to be proclaimed strongly. In Ireland, and indeed the world’s people, are looking for moral and spiritual Leadership, and Pope Francis, gives hope when he speaks out against war, nuclear weapons and for peace and disarmament. In 1978, Betty Williams and I had the privilege of a 30-minute private conversation with Pope John Paul II in the Vatican. Coming out of a violent conflict in N. Ireland, we appealed to the Pope to reject the “Just War” theory and to bring forward a theology of nonviolence and peace for the Catholic Church. When Pope John Paul visited Ireland the following year he appealed to people to reject violence and build peace. However, we still await from the Vatican an encyclical on Christian nonviolence and a rejection of “Just War” theology. 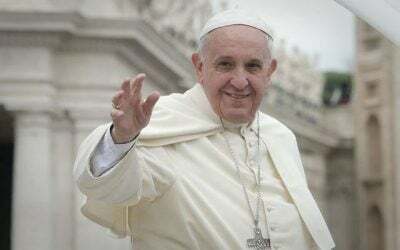 Pope Francis in his papacy has given spiritual leadership and called for the total abolition of nuclear weapons and peace making. His visit to Knock, whilst rightly focusing on church’s abuse scandals, was a missed opportunity to call for nonviolence, and the abolition of militarism and war. I believe Christ’s message of nonviolence, has been betrayed and perverted by the theology of ‘Just war’ which has led to the blessing of armies, armaments, militarism and wars in which Christians feel they can justifiably play a leading role. The ‘Just war’ theology has also been used by those waging ‘armed struggles’ invasions, and military occupations. However, if we have not as a Christian community taught nonviolence in our education systems, in our theological colleges, in our homes, in our churches, how are we to make the choice between violence and nonviolence? How are we to prevent abuse, violence, or politically driven deprivation when their root, the concept of a ‘Just War’ retains any credibility? I believe that when the church chooses to reject “Just War” theology and replaces it with a theology of nonviolence, then other things in the church will change. I am grateful for the visit of Pope Francis as I believe his humility and love in speaking to the suffering of the victims and survivors, has begun a healing process, and raised hope for a new beginning for many people. I am also grateful for the Pope’s call this August to continue working for peace and in support of the Peace Process. In his speeches Pope Francis reminded us of our duty to protect the children from abuse and teach peace. I believe the greatest abuse to millions of children is that of guns, militarism and wars, and that we are challenged to work for complete disarmament and end to violence and war. In my opinion an Encyclical on Nonviolence and Disarmament from Pope Francis would give hope and encourage us all to take up our responsibility–which is and always has been–to build peace in Ireland and Peace in the World. Mairead Corrigan Maguire, co-founder of Peace People, is a member of the TRANSCEND Network for Peace Development Environment. She won the 1976 Nobel Peace Prize for her work for peace in Northern Ireland. Her book The Vision of Peace (edited by John Dear, with a foreword by Desmond Tutu and a preface by the Dalai Lama) is available from www.wipfandstock.com. She lives in Belfast, Northern Ireland. See: www.peacepeople.com. Mairead Corrigan Maguire is a frequent contributor to Global Research.